I love pickles. You all probably know that by now. Here’s another pickle recipe for you. This low-amine pickle is a quick salt pickle substitute for kimchee. 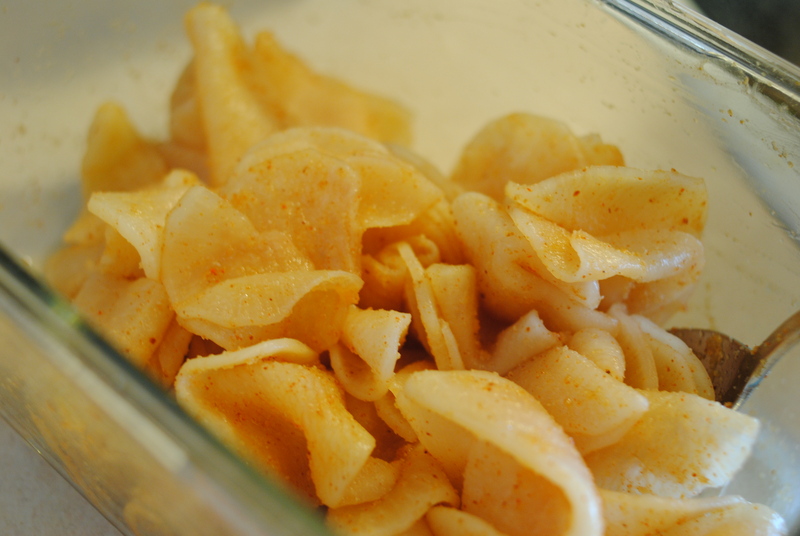 You can do it with traditional Napa cabbage as well, but I prefer the crisp texture of the daikon radish kimchee pickle. Enjoy! 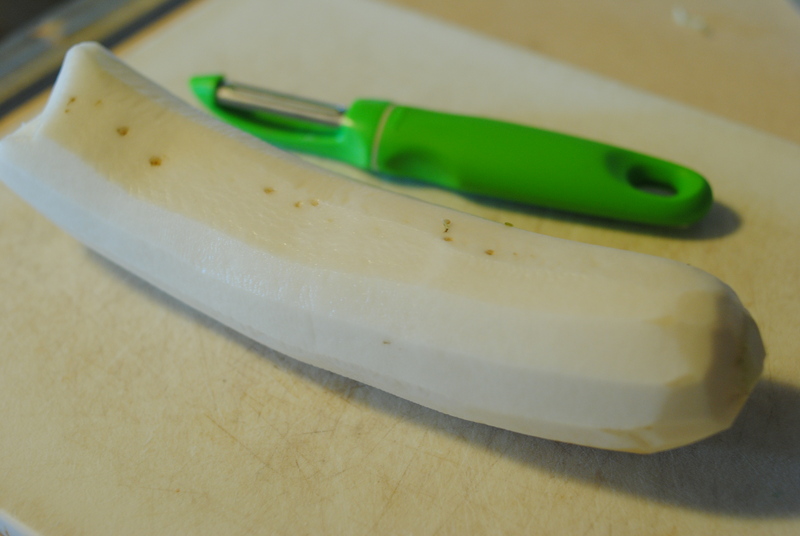 Use a mandoline to slice your daikon radish thinly. 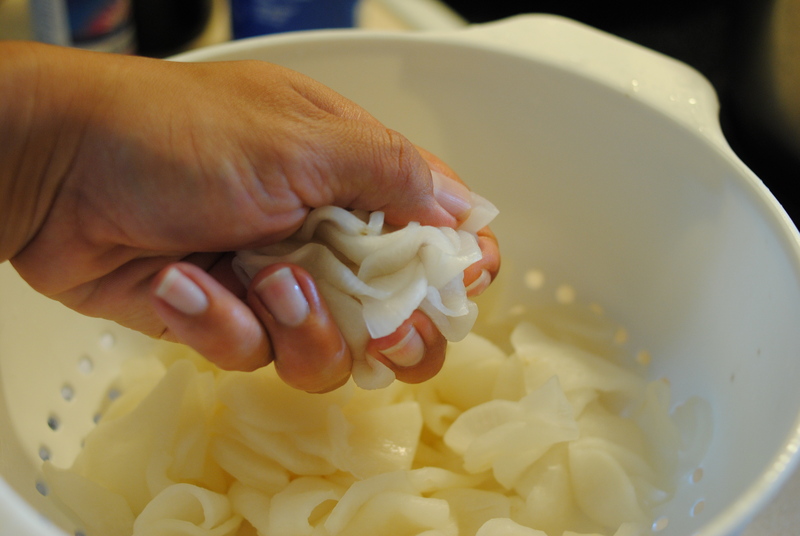 The thinner you slice your daikon radish, the faster they will pickle as the water is pulled out of the daikon. Put in a tupperware with a good seal. Add salt and rub it in to the pickle slices. Close lid and refrigerate for at least 12 hours, shaking occasionally to mix salt and liquids around. When the texture of the kimchee pickle slices becomes very pliable, pour into colander and drain. Run water over the top of the low-amine pickles and massage them in your hand, squeezing out all the water each time. Do so for at least two minutes, then taste pickle. If too salty, continue massaging pickles and squeezing out salted water until saltiness is at desired level. Squeeze all water out and put the kimchee daikon pickles back in the tupperware. Add all other ingredients and mix together until all are evenly coated. Serve as an accompaniment to your meal or with a side of rice. Pickles… My greatest obsession. I love them so! But of course, with an amine allergy, they’re impossible to eat. Here’s a quick and easy low-amine dill pickle substitute recipe that will leave your taste buds satisfied and your pickle craving fulfilled. Wash cucumber and cut ends off. 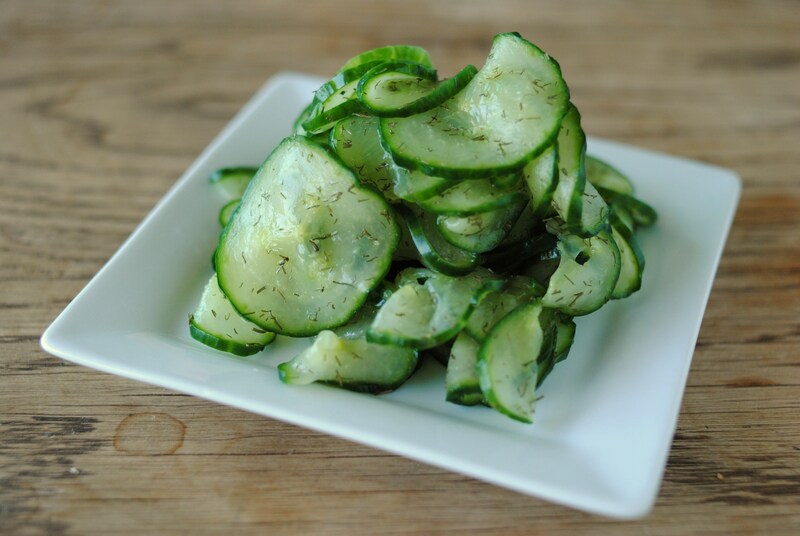 Use a mandoline to slice cucumber very thinly – the thinner you slice them, the faster they’ll pickle. Put all cucumber slices in a tupperware with a good seal. Cover in salt and rub salt into the cucumber slices. Close tupperware and put in fridge for at least 12 hours, taking out to shake tupperware occasionally. When cucumber slices have reached a flexible pickle consistency, drain into a colander. Run water over low-amine pickle substitute and massage, to get salt out. Massage and massage, squeezing the water out firmly. After a few rinses, taste. When the salt content tastes right to you, squeeze all water out of the pickle substitutes and place in bowl. Add ascorbic acid and dill. Mix well and taste. Add more ascorbic acid or dill as needed, but note that a little goes a long way! Enjoy your dill pickle substitutes! 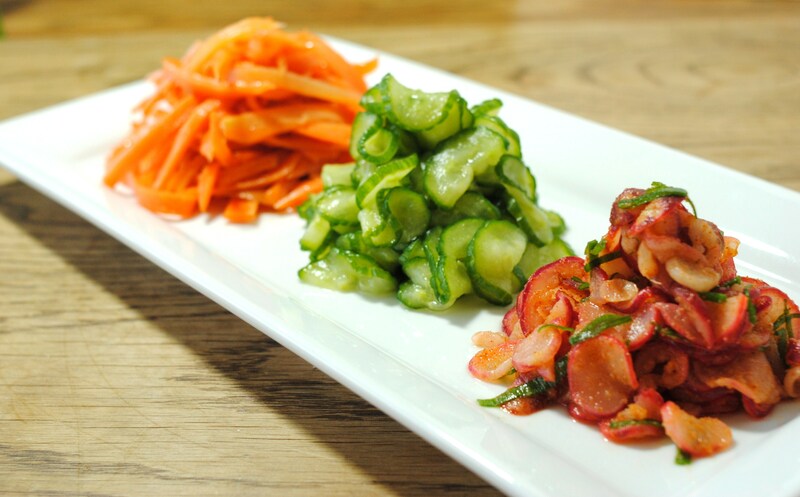 Low-Amine "Soy Sauce" Carrot Pickles, Low-Amine Traditional Cucumber Pickles, and Low-Amine "Kimchee" Radish Pickles. I made three kinds of low-amine pickles last week. All are made with low-amine ingredients (carrot, cucumber, and radish), and prepared in a low-amine method. The vegetables had to salt in the fridge overnight, but that’s about the most ageing these low-amine pickles did. Wash and cut all vegetables and keep separate. 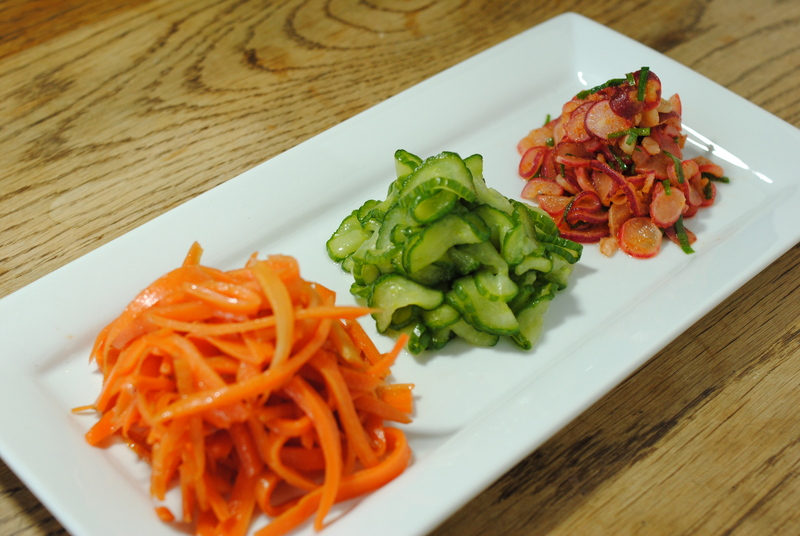 You can do yours however you’d like, but I sliced the cucumbers and radishes thinly, and julienned the carrots. Remember to keep them thin. Salt liberally and rub salt into vegetables. Let sit in salt overnight. Give them the occasional rubbing/mixing, and drain off excess liquids that have collected, if you can. Rinse off vegetables very well. I rinse them at least three times each and give the vegetables a firm massage and squeezing out, to remove as much salt and water as possible. Continue repeating this until they are slightly salty, but not unpalatable. Coat vegetables in about 1/2 tsp ascorbic acid each, or to taste. It should have a “pickled” taste, but not be too tart. Add sugar, soy sauce substitute and sesame oil substitute to the carrots and mix together very well, until sugar dissolves completely. Slice one green stem of green onion into very thin rings and set aside. Add garlic powder, onion powder, and cayenne to radishes. Mix well, and add green onion slices in. Toss together. Present together on a dish, or separately. Chill until used. They will keep for a few days in the fridge. Pickled carrots, pickled cucumbers, pickled radishes, all done low-amine. These Vietnamese pickled daikon radishes and carrots are almost indistinguishable in taste or texture from the “real deal” pickles. They are a delicious addition to Vietnamese dishes, and can be eaten as a snack, in sandwiches, in salads, or more. Use your imagination, and enjoy! Wash carrots and daikon radish. Cut daikon and carrots into pieces about 1.5″ – 2″ long, and use a mandoline to slice them into flat pieces. 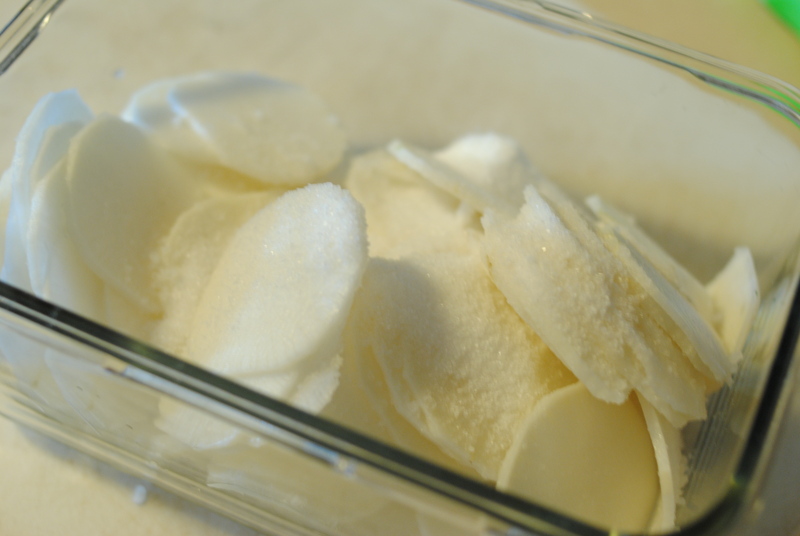 Julienne daikon and radish, and in a large bowl, rub them down with the salt. Once the salt content has been reduced, sprinkle with ascorbic acid and sugar, and rub well. Allow to chill in the fridge before use for at least 30 minutes. Check out the LOW AMINE STORE!!! Enter your email address to subscribe to Low Amine Recipes and receive notifications of new posts by email. Amine Allergy? What are the Symptoms? My Story 4: Amines… Now What? With a low amine diet, knowing how to cook is essential. Virtually all ingredients in a low amine diet are raw, unprocessed foods. My first few months of eating low amine foods meant eating boring, boring foods. I didn't know what to do with the ingredients. After many kitchen science experiments, I have come up with low amine recipes that keep me fed and happy while keeping my swollen joints at bay. Whether you have an amine allergy or intolerance (tyramine, salicylic acid, histamine, or other amines), or are on MAOIs, I hope that these low amine recipes help you eat well and feel good about yourself, your life, and your diet. I'm here to prove to myself and to you that eating low amine foods can be delicious. I Can’t Bake: Carob Brownies? Cupcakes? Muffins? Create a free website or blog at WordPress.com. | RSS 2.0 | Comments RSS 2.0 | The Quentin Theme.